A cell phone was ringing in the gut of a dead fish, 100 needles were swallowed, and an American Flag vanished into thin air. These were among the magical tricks Penn & Teller performed at their recent State Theatre New Jersey appearance. The audience participated as a few people were hand-picked to join them on stage. For over 40 years, the duo has been performing their unique magic for countless audiences. Their Las Vegas show has been running for 15 years and is the longest one in the city’s history. Combining magic, comedy, philosophy, and physics, the result is nothing short of genius. The show started with an audience member giving up her cell phone which eventually ended up ringing inside the carcass of a fish in a box, under a seat in the audience. Working in tandem, Penn speaks and Teller fleshes out the acts with hilarious quirky movements and facial expressions, endearing him to the audience. In one act Teller turned coins into goldfish. Gently placing coins into a participant’s hands, he then transfers them to the tank, stirs the water, and voila —a flurry of goldfish appears. Prior to lighting up a flag, Penn commented on the duo’s patriotism. A flick of a lighter and the flag vanishes, only to reappear waving on the flagpole. For one of the acts, they explained the mechanics of sleight of hand. Teller smokes a cigarette, performs a trick with it, and then Penn tells the audience that in order to understand Teller’s life (how he does magic) one needs to understand the 7 basic principles of magic. Penn debunks the trick, explaining the principles, but some people—myself included—prefer to stay in the mystery of it all, not wanting to know the how. The amazing Needle Trick starts with Teller meticulously swallowing 100 needles and through facial and body contortions, he convinces the audience that all 100 have settled in his stomach. He retrieves them slowly and magically, and when they reappear from his mouth they are strung together on six feet of thread. 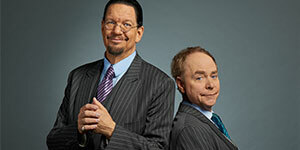 The trick is based on an Ancient East Indian illusion and it was the first trick Penn saw Teller perform many years ago in Central New Jersey. The trick Shadows wowed me. A rose sits in a vase and its shadow appears on a drawing pad resting on an easel. Teller cuts the shadow of the flower’s leaves and petals and the real flower falls in unison. The evening ended with a darkened theater as Penn explained the duo’s love of the American Sideshow, part of traveling carnivals. He said the dark theater was reminiscent of a carnival tent and so we were in their tent. Teller lights a few sticks and hands them to Penn who then performs a fire-eating trick. The talented duo’s love of magic is palatable and contagious. And while they give a taste of debunking the mystery of it all, they also leave you in a state of wonder and awe which are the gifts of magic.